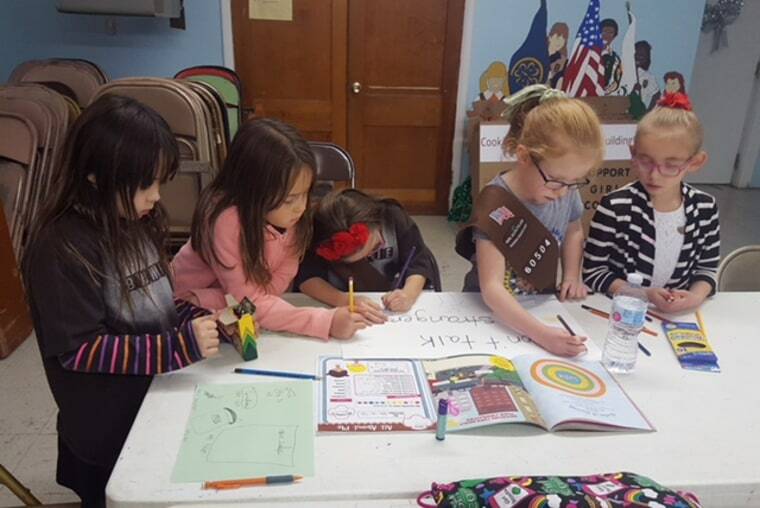 If you thought being a Girl Scout was all camping, crafting, and cooking, think again. If you think being a Girl Scout is all camping, crafting, and cooking, think again. For the first time, millions of Girl Scouts nationwide are taking on hacking and cybercrime as they work towards earning newly introduced cybersecurity badges. Girl Scouts of the USA teamed up with security company Palo Alto Networks to devise a curriculum that educates young girls about the basics of computer networks, cyber attacks, and online safety. Sylvia Acevedo, CEO of GSUSA, said they created the program based on demand from the girls themselves. "Protecting their identity online, how to protect themselves when they're browsing, how to protect their computers, their family networks from being hacked, those are things that are of real interest to girls," Acevedo said in an interview with NBC News. In Alameda, California, Girl Scouts of Troop 32749 are already hard at work learning about the basics of coding and computer networks. "Evelyn, you're going to be my message sender," said troop leader Danielle Zorn, holding an unruly ball of green yarn. One by one, Zorn cut sections of string and distributed them to the nine and ten-year olds. As instructed, Girl Scout Evelyn began stringing cards with letters written on them onto the green string that connected the dozen girls in a spiderweb of yarn. "I am sending a card to my friend Kylie," said Sophia, unleashing her card and message along her section of the yarn network. "She'll have some words to put together," Sophia explained. While junior scouts learn these and other basics, like the fundamentals of binary code, a total of 18 cybersecurity badges will eventually be rolled out nationwide at various skill levels for girls in grades K-12. Girl Scouts of the USA have been increasing programming in the STEM fields of science, technology, engineering, and math in recent years, but this represents another step further. And while the program is designed to be fun, the hope is that it will also inspire more girls to pursue careers in STEM. Women are vastly underrepresented in cybersecurity, holding only 11 percent of jobs globally, according to the 2017 Global Information Security Workforce Study: Women in Cybersecurity. "Cybersecurity is vital to protect our financial systems, our voting systems, you know, our defense systems. So we absolutely need to have the rising generation interested and prepared in cyber security," said Acevedo. Acevedo believes that by introducing these skills to girls as young as five, they could grow up to reverse the ugly trends of underrepresented women in tech and the rampant bro-culture of tech hubs like Silicon Valley. "It's going to just make them feel empowered that 'I can go and do anything,'" said Rinki Sethi, the Senior Director of Information Security at Palo Alto Networks, and one of the advisers for the cybersecurity badge's curriculum. "Cybersecurity's... got the toughest challenges that we need to go and solve. And we're going to need the best and the greatest minds and a really thought-diverse group to go and fill those gaps that we have today in the talent pool," said Sethi. In Alameda, the girls in Troop 32749 are up for the challenge. "It makes me feel, well, very special, because I'm just helping people that could get hurt and their money could get stolen," explained Girl Scout Delaney, threading multicolored beads that represent the building blocks of binary code. Her fellow Girl Scout, Evelyn, concurred, and hopes to pursue a career in engineering. "Some people that have companies have, like, a bias towards men or boys. And then they choose the boys to do jobs," said Evelyn, in an interview with Jo Ling Kent. "Do you guys think that girls are just as good as boys in science and engineering?" Kent posed to the group of girls. "Definitely!" came the enthusiastic response, in unison. "Sometimes even better," said Delaney with a knowing smile.